With all the parts detachable, Magoo has been added more flexible features, whose liquid volume and air inflow are adjustable. Seeing from the individual window of liquid level, the liquid volume is more intuitive. What’s more, customers can choose pluggable mouthpieces according to their own favors. From this product, people can also enjoy the fun of DIY, as customers can replace the heating coil (single and dual) and entire atomizer head by themselves. In addition, the scalable positive pole contact can better adapt and protect the battery contacts. Firstly, screw the atomizer head onto the atomizer base; secondly, screw the mouthpiece to the atomizer head; thirdly, screw on the atomizer tube, then the tube cover; at last, the mouthpiece cover. Single heating coil: first, wrap the heating coil on the middle of the delivery string for several laps with both ends left enough length to reach the bottom of the atomizer head A. Then wrap the ends on the atomizer head part A, separately nipped by the plastic ring and the silicon ring, which are the positive and negative conversion. Finally, put the delivery string into the matching slots and screw the atomizer part B on. Dual heating coil: the detail of each coil is just the same as the single one. The only difference is that the dual one has two crisscrossed slots, so you should match them with two delivery rings. Unscrew the mouthpiece cover and refill the liquid from the inwall of the tube cover. You can see the liquid level from the plastic part of the atomize tube. Please do not fill it completely full. 1. 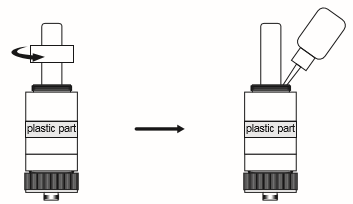 Since there is an air inlet in the atomizer base, by screwing the thread ring on the atomizer base, the size of the inlet could be adjusted so as to control the air inflow. 2. When the mouthpiece was screwed, the fluid volume that flows into the atomizer head could be controlled, which determines the vapor volume. 3. The heating coil and the entire atomizer head could be replaced by DIY. 1. Only have your Magoo repaired by iSmoka. Do not attempt to repair the unit by yourself as damage or personal injury may occur. 2. Please don’t put the Magoo under high temperature or damp conditions, or it might be damaged. The appropriate operation temperature is within 0℃ to 45℃ while charging and -10℃ to 60℃ while using. 5. Do not assemble it with products of other brands, if it is damaged or is unable to use by this reason, iSmoka will not take any responsibility.